Vegetable Jalfrezi Recipe - Assorted Vegetables In A Tangy Sauce. Vegetable Jalfrezi is a very easy to make Indian vegetarian recipe. 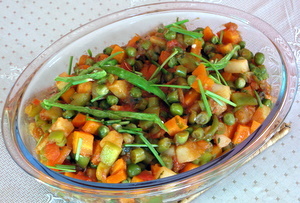 Most important, it is very nutritious and healthy recipe. Dice all of the above vegetables into equal size(small cubes) and steam. Not too soft though. Heat the oil in a pan (kadai). Add the ginger and saute for a minute, then add the onions and saute for 2-3 minutes till onions are soft. Now add the tomatoes and saute for 5 more minutes till they become soft and little dry. Add the green chili, tomato puree, sugar, salt and tomato ketchup. Add the steamed vegetables into this and gently mix, till all veggies are coated well. Add the chopped coriander and cook for a minute. Then turn off the heat. Sprinkle the chopped spring onions on top and serve hot with rice or bread.